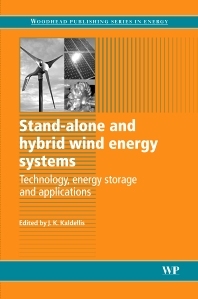 Part 1 Fundamental science and engineering: Overview of stand-alone and hybrid wind energy systems; Overview of energy storage technologies; Design and performance optimisation; Feasibility assessment. Part 2 Development of energy systems and energy storage technology: Stand-alone wind; Hybrid wind-diesel; Hybrid wind-photovoltaic; Hybrid wind-hydrogen; Hybrid wind-hydropower; Electro-chemical energy storage; Flywheel energy storage; Compressed air energy storage. Part 3 Applications: Integration into remote micro-grids; Integration into buildings; Desalination. Professor John K. Kaldellis is Head of the Soft Energy Applications & Environmental Protection Laboratory (SEALAB) at the Technological Education Institute of Piraeus, Greece. Prof. Kaldellis has long and extensive academic experience in the development and application of renewable energy sources with an emphasis in wind-based renewable energy systems and many research interests in the field of hybrid wind energy systems.